As a principle walking and cycling permeability should be greater than permeability for cars and other motor traffic. IMAGE: Theoretical one-way system for motor traffic which would cut rat-running in a min-super block. All councils should be obliged to draw up traffic circulation plans to cover built up areas, and these should clearly define the nature of roads and streets as well as account for the movement of pedestrians, cyclists, users of mobility devices, scooters, public transport, deliveries, HGVs. motorbikes, and cars. This process should influence the roll out of traffic calming and lower speed limits, rather than, for example, streets being defined by their speed limit in a speed-limit process. 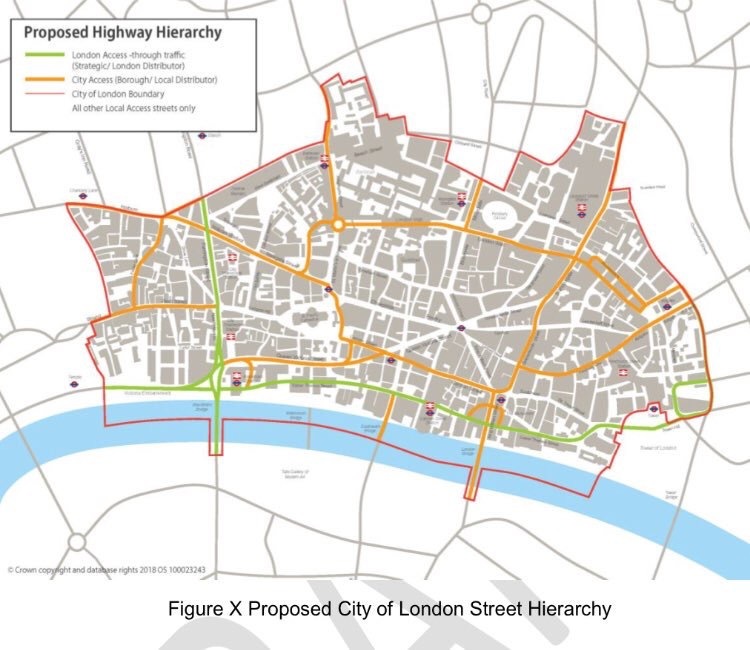 IMAGE: Planned City of London road hierarchy strategy is set to help the boroughs to give priority to walking, cycling and public transport and reduce overall motor traffic levels. Walking and cycle routes must be designed to accommodate not just standard wheelchairs, prams, and bicycles but those of all shapes and sizes. 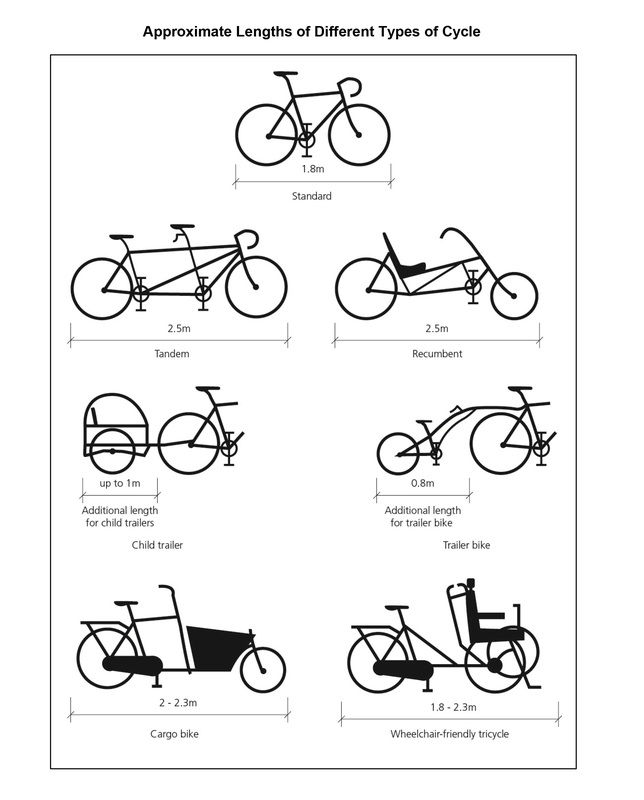 In the case of bicycles this includes bicycles with wide handlebars, bicycles of different heights (ie children’s bicycles to different sized adult bicycles); bicycles with panniers, baskets, crates or child seats on them; cargo bicycles and cargo tricycles (which carry children, goods and even wheelchairs); tricycles for people with balance and mobility issues; bicycles with trailers attached; recumbents; and tandems. 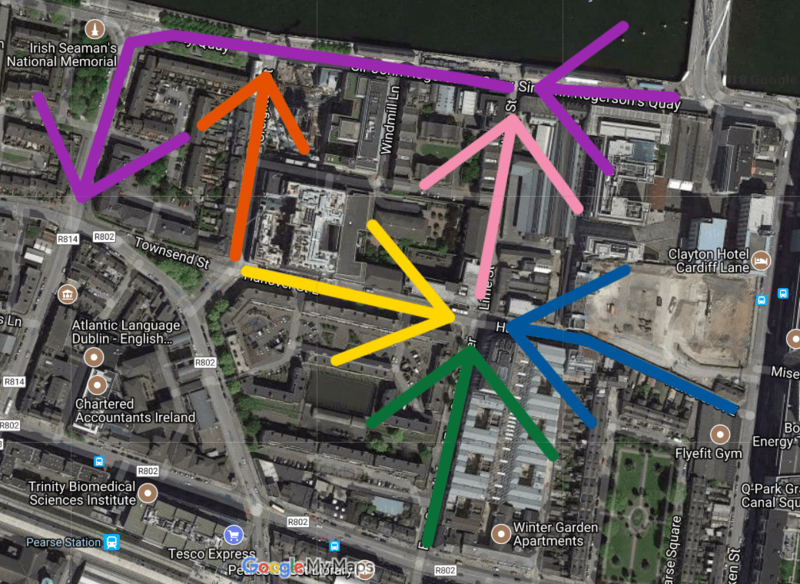 Walking and cycle routes — including everything from greenways to routes on main roads — need to have strong permeability into side streets, housing estates, schools, colleges, retail, leisure centres, places and areas of employment etc. Barriers which stop any standard type of bicycle and/or trailer (for instance ‘kissing gates’ and close-set bollards) must be removed as soon as possible and must never be used on new routes. 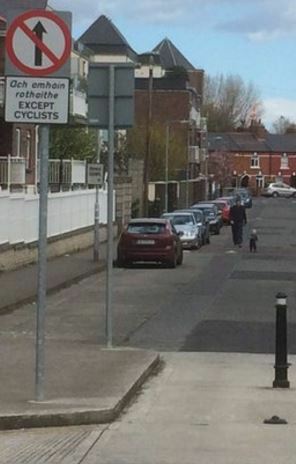 IMAGE: An example of filtered permeability in Ringsend, Dublin, where through motorised traffic was closed off, but walking and cycling is stilled allowed to pass through. Note the toddler walking on the carrageway. The design of many existing Irish housing estates has restricted permeability and to make walking, cycling and public transport attractive, residents and politicians must be encouraged to remove many of these barriers (walls, fences etc). Filtered permeability (using bollards, planters etc) should be used to close through traffic on current residential and other streets and roads with the goal of not just making cycling more attractive but to cut rat-running traffic, making streets more liveable and reducing the risks and harms to local residents. Where a barrier or planter or other barrier is required, a single row of bollards / planters should be used — these must be visible in the dark/low light conditions and located with a strict absolute minimum spacing of 1.5 metre from each other or walls/fences. Where barriers of any type (including bollards) are used, those responsible for designing them must note that such obstacles are linked to serious injury and even death, so care must be used in (1) making barriers visible in dark and low light conditions and (2) in not locating barriers directly beside junctions, on ramps, other inclines, or bends. Swing gates, kissing gates, a-frames, k-frame and other barriers which stop many types of prams, wheelchairs and bicycles must not be used in any circumstances — blocking legitimate users — including bicycles for people with disabilities or for carrying children — is not an acceptable solution to issues like anti-social behaviour. Where such are in place, councils or other public body must plan for their removal as soon as possible. Councils and other public authorities should review the use of barriers and bollards on their lands — this process should include mapping their location, recording the bollards by taking photographs of them, and ensuring that the design follows the guidance on this page. This process should be aimed at barrier removal for greater access, better safety, and lower costs. Where bollards are to be maintained, these must be visible in dark and low light conditions and not located directly beside junctions or on ramps or inclines or bends — non-compliant barriers should be replaced or re-positioned. Only cycling and walking is allowed at the front of this school and playground. Motoring access to two car parking spaces but access farther is blocked by bollards. Removal of bollard where there’s a low likelihood of motorists using the cycle path. Example of bollard breaking all rules of bollards — on bend, too close to junction, and on sharp incline. Bollards too close to junction. Swing gate not accessible for users of many bicycles, including people with mobility issues who cycle. Barriers getting hit by bicycles and trailers shows that they are not wide enough..
Two bollards in the middle of the path not visible from a short distance away even with strong bicycle lights. Bollard not visible on dark night while right beside it unless light directly on it. Good permeability but wall/fence/bush unnecessary high (open supermarket car park on one side and Government department’s car park on the other) — lowers feeling of safety.